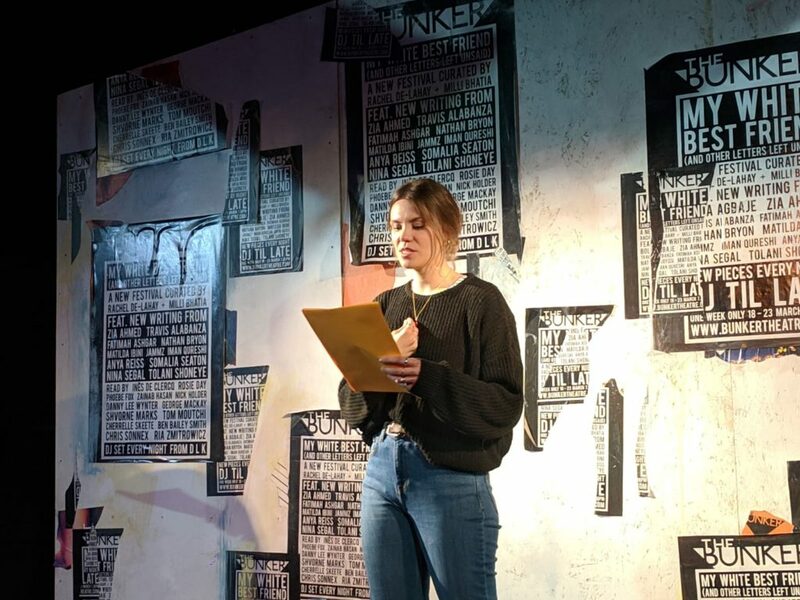 Yesterday evening at The Bunker felt unlike any evening I’ve ever spent in a theatre, and as such, I felt it was right to write about it in a totally different way. I’ve introduced an I for starters, and so I’m going to introduce myself too. I’m a cis, pansexual, middle class white woman, aged 48. It feels essential to let you know this, as the series of evenings which Rachel De-Lahay and Millie Bhatia have curated put identity centre stage – racial identity, class identity, sexual identity and gender identity – and one of the things that last night made very clear, is that we can only view things through our own identity prism. So the old myth of the invisible critic just won’t wash. The Bunker felt like a club last night. Buzzy. There was an excellent DJ, we were all standing, and we were offered a drink (rum and Ting, delicious) when we walked into the space. It was a young crowd and it looked and felt and sounded like London; like the London that is outside, that we journeyed through to get there. Which felt great. And made me realise how rare that is. There were knots of friends chatting, predominantly people of colour, and a sense of relaxed ownership, a comfortable knowledge – this night is for us, and about us – which I could only share from the edges. And that feeling taught me something, even before the show began. Even using the word show seems a bit weird. It wasn’t really a show. It was an event, a sharing. Rachel De-Lahay’s idea is a simple one: different writers leave a letter to be read out loud by a specific performer. The letter is in a sealed envelope and the performer reads it live, having never read it before. The evening kicks off with a long letter that Rachel wrote to one of her best friends, Inès de Clercq, and it is Inès who reads it. The letter is honest, and funny and uncomfortable for Inès to read, as it is a reminder that no matter how much Rachel loves her, her race can’t help but play a part in their relationship. It is uncomfortable for any white person to hear, to witness, to think about, and that’s the point. The young woman standing in front of me was completely overwhelmed by tears half way through this reading, and, throughout the night, the electricity of words being spoken that are so often, too often, left unsaid, was palpable. There was a charge; the air crackled with it. Of urgency, of energy, of presence. The next letter was written as a piece of spoken word poetry. Fantastic writing by Jammz; it also dealt with race in friendship, and Ben Bailey Smith (‘I’m mixed race, so I’m my own white best friend’) was direct and charming, and did the words justice. The final, and longest letter of the evening was written by Zia Ahmed and read by Zainab Hasan. This took a different form again, with Zainab reading out a selection of quotes – from Zia himself, from the Home Secretary Sajid Javid, from popular Muslim comedians – before reading Zia’s unbearably painful story of continual racist profiling which led him finally to stop his job as a nanny. It went against the grain to give this show a star rating, as the words and stories of these artists and performers don’t need my critical validation, but they do need to be listened to. So consider my five stars a way of saying that this is essential theatre. Get yourself a ticket and open your ears.